It’s not exactly a topping out, but after digging a hole to a 65-foot depth and building a below-grade, seven-level parking garage for a $75 million, 20-story luxury residential and retail tower at the former Hard Rock site in Uptown, developer Rick Cavenaugh is grateful to be back to grade. “We started pouring the first half of the slab today and by next week everything goes up from there,” Cavenaugh, president of Illinois-based development firm Stoneleigh Cos. LLC, told the Dallas Business Journal. The development firm lost about a month of construction related to wet weather in the spring — a commonality issue at a number of Dallas-Fort Worth development sites this year — and is ready to make up for lost time. Construction crews with Hunt Construction Group have already made up two weeks of the lost month. Cavenaugh said he hopes to make up the remaining two weeks if the weather continues to cooperate. The concrete atop the garage is being poured to exact specifications for the two restaurants — Brazilian steakhouse Fogo de Chao Churrascaria and Style & Grace — committed to the ground floor of the tower. The second-floor pool deck and outdoor pool bar for Style & Grace will also soon be under construction. One Uptown will include a curvy facade designed by Dallas-based architect Humphreys Partners. Plans for the tower include 198 luxury apartments, 18,500 square feet of retail and restaurant space and a 480-car underground parking garage. The tower will have an amenity deck for residents on the rooftop, which will include the city’s highest private rooftop infinity pool, fire pits, outdoor kitchen, cabanas and a game room. 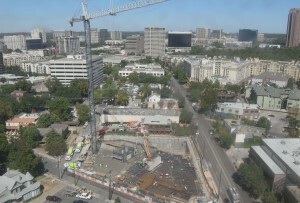 One Uptown isn’t the only luxury apartment building under construction in the walkable vicinity. Dallas-based StreetLights is beginning to lease The Jordan, a luxury apartment tower that is still under construction, and Gables Residential’s Whole Foods-anchored luxury apartment and townhome project. That doesn’t have Cavenaugh concerned. And One Uptown has the advantage of having a desired location in close proximity to the McKinney Avenue bar and restaurant scene, he said. That echoes a similar conversation I had with Gables Residential President and CEO Sue Ansel recently about the demand for high-end, condo-style finishes in Dallas apartments. Cavenaugh said he expects to top out on One Uptown by April 1. The tower’s initial occupancy is slated for August 2016.